Just like that… the first month of 2018 is coming to an end. Did it speed by quickly or are you wondering why January feels like forever? This month had five Mondays, people! I’m pretty excited for the end of the month (January 31th) for the Super Blue Blood Moon, which is a total lunar eclipse (making the moon appear red or coppery colour), a blue moon (second full moon in a one-month period) and a supermoon (a full moon that’s at its closest possible point to Earth; it’s bigger and brighter too) all in one. Super cool! Hopefully, I’ll be able to drag myself out of bed early, grab a monster cup of coffee, a cinnamon pecan applesauce muffin and head out. If my husband and I didn’t already eat all of the baby kale and brown rice salad, I would grab a container of that stuff too, and set out to sky-watch. If I sleep through it or I can’t see it live, at least there is always the online footage. Anyway, back to this delish winter salad! The tasty ingredients in the salad! Scroll down below for the full ingredient amounts and instructions. Assemble the salad ingredients in a large bowl. I love all the different colours! Brown Rice: Brown rice affordably bulks up the salad. It has a nuttier flavour than white rice and is healthier. It's high in fiber, gluten-free, and an excellent source of nutrients such as manganese, which is essential to bone health. Baby Kale: It’s leafy and dark green. It’s a more tender, more mild version of mature kale. Raw baby kale has a light peppery, slightly bitter flavour that's not overpowering. It's loaded with healthy nutrients such as vitamin A, vitamin C, calcium, and iron too. Substitute with baby arugula or spinach if prefer. Clementines: Clementines are a hybrid of a mandarin orange and sweet orange. They are juicy, sweet, tart, tangy, and have less acidity than a regular a orange. 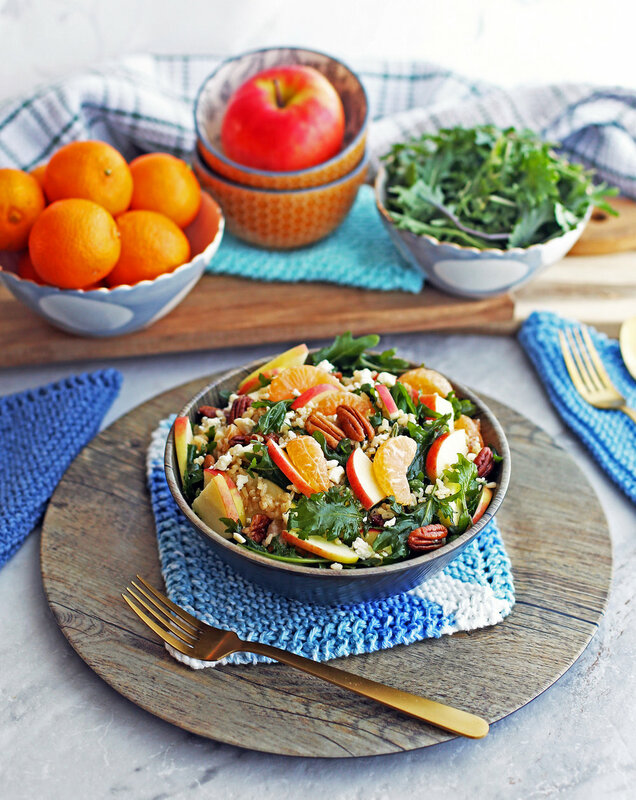 I was inspired to make this salad featuring these little vibrant orange fruits because I bought a large five pound bag of these oranges to snack on. They are similar to mandarin oranges or tangerines; easy to peel, section into its natural wedges, and eat. Mandarins and tangerines would be make good substitutes for clementines in this recipe too. Apple: I like to use a sweet apple for this recipe such as Ambrosia, Gala, or Red Delicious, and slice them into thin pieces. It adds a delicious sweetness and crunch to the salad. I love throwing apples into salads because different varieties are always available at supermarkets and are usually very inexpensive. Pecans: They are nutty, a little sweet, crunchy, and buttery. Pecans are just tasty. It’s a rich source of fiber and also a good source of protein. They're also high in calories so if you are watching your calories, use less than what I recommend in the ingredients list below. A similar substitute would be walnuts. Also, I’m curious, how do you pronounce “pecans?” Pee-CANs or Pee-KAHNs? I say the former. If you pronounce it another way, let me know. Feta cheese: This cheese has bold, tangy, and salty flavours. I like to crumble the feta into very small pieces so that you get a little bit of creamy cheese with each bite. 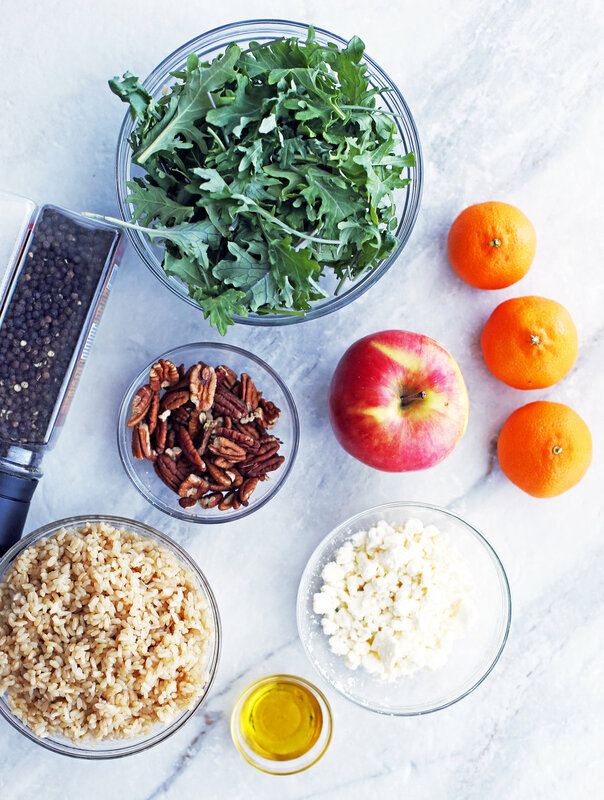 A simple dressing: It's made with more clementines (the juice), extra virgin olive oil (I like to use a mild variety that’s floral, slightly pungent, and low in bitterness, but use the type that you like best in salads), a little maple syrup for rich sweetness, and a pinch of salt and pepper. Full of flavour: Sweet, salty, citrusy, and slightly bitter. It hits the all the taste buds in a good way! Definitely not an one-note salad! Texture-rich: Chewy brown rice (cook it to your preference e.g. 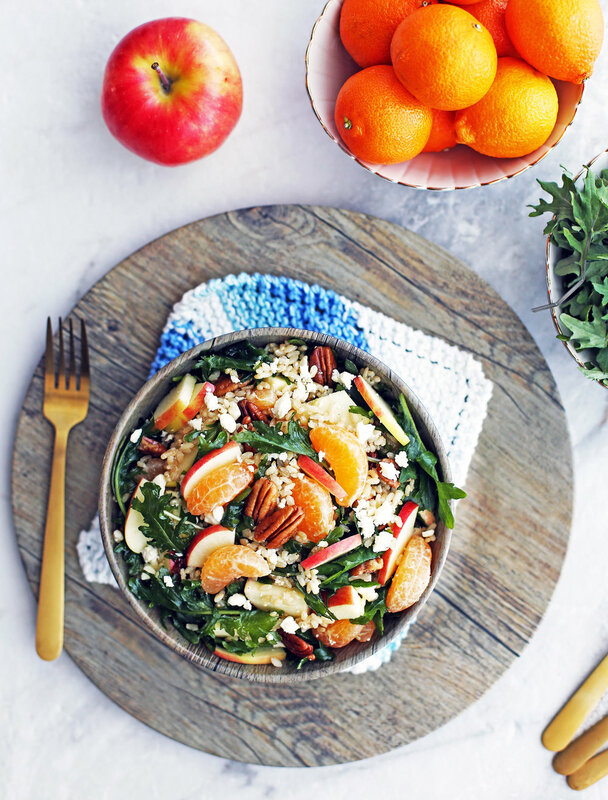 fluffy and really tender if you prefer), crunchy apples and pecans, tender baby kale, juicy soft clementines, and creamy feta cheese gives this salad interesting textural components. Quick and easy: Prepare the brown rice ahead of time and then assemble in ten minutes or less. Can be served warm or chilled: Mix the ingredients in warm rice and serve right away or let it chill in the refrigerator and serve as a cold salad. A great vegetarian and gluten-free option! Serve it as a light meal, appetizer, or as a side dish. I hope you enjoy this dish! If you do try this recipe, please let me know by rating and commenting below or by tagging me on any of my social media. In a small bowl, whisk together the dressing ingredients until well combined ***(see third note). Taste and adjust the dressing to your preference. Set aside. In a large bowl, combine the salad ingredients, then drizzle the desired amount of vinaigrette on top. Toss well to combine. Serve immediately or cover and chill in the refrigerator until ready to serve (up to three days). *Cook brown rice (dry or instant rice) according to package directions or use the Instant Pot. INSTANT POT directions for brown rice: combine 1 cup of brown rice with 1 cup of water. Seal and cook at high (manual) pressure for 15 minutes and then quick release after 5 minutes. The resulting rice with be chewy, but completely cooked through. **You can substitute with 2 tbsp of regular orange juice (it is more sweet and acidic than regular clementines). ***TIP: Cut the clementines in half (do not peel) and use a citrus reamer or juicer to get the most juice out of it.